The economy secretary wants Westminster to deliver electric trains from Cardiff to Swansea - or give Welsh Government the power and money to do so. Ken Skates said unless a commitment was honoured now "we may never see it". Welsh Secretary Alun Cairns said the latest hybrid electric-diesel trains would run to Swansea from this autumn. One leading transport expert warned there was a risk electrification would be costly to re-start again if the current programme stopped at Cardiff. Network Rail has called the electrification of the line to south Wales "the biggest single investment in the Great Western railway since Brunel". It is working to deliver electrification between London and Cardiff by December 2018, shaving 14 minutes off a typical journey. To get the railway ready for the overhead posts and wires, some bridges - including Splott Road bridge in Cardiff - need to be reconstructed as they are currently too low to accommodate this new equipment. It would not be before 2024 that the project reaches Swansea under existing projections. Improving the rail system for quicker, quieter trains is seen as important for the economy and to meet growing demand. Passenger growth is forecast as increasing 142% over the next 25 years between London and Cardiff. Up to 32m passengers are forecast to be using Cardiff Central Station by 2043. Between Swansea and London, the number of passengers is forecast as more than doubling in 25 years. The numbers commuting from local stations into Swansea is also anticipated to almost double in the same period. Mr Skates said Wales had been "under-funded incredibly" in terms of railway infrastructure. He said Wales had about 6% of the network but only received about 1.5% of the funding in the current period. "Undoubtedly we need to modernise the infrastructure and in fact we've stepped in as Welsh Government during that period and invested something like £200m," he said. "Our call on UK Government is to honour commitments already given to modernise the railway network, including the main line in south Wales. "It's crucially important to get people better connected between places of work, services and home. We need modernisation all the way through not just to Cardiff but to Swansea. So it's absolutely imperative the UK Government honours commitments. "Now is the time to deliver. If we don't see modernisation delivered now, we may never see it. If they're not going to deliver it now, and on time, they should hand us the money and powers to deliver the upgrades that are required." 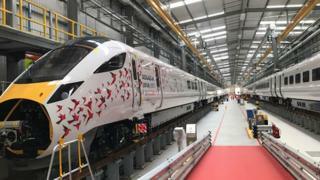 Welsh Secretary Alun Cairns on Monday took a look inside the new hybrid trains which will start operating on the Great Western service this autumn. To start with, they will run on electric between London and Swindon and then switch to diesel for the rest of the journey. Each train will have an extra 159 seats. Mr Cairns would not be drawn on further electrification west of Cardiff but said the new trains would bring benefits to Swansea passengers sooner than envisaged. "Passengers won't know if they're running on diesel or electric," he said. "When the original decision was made to electrify the Great Western main line there was only the view of running an electric-only train. "We're now using the latest technology, it would've been foolish not to have a bi-modal train. So as a result of the change in government emphasis, we're focused on outcomes. "Now they've electrified to Swindon, we're having the latest trains available this autumn, so Swansea will be benefiting from new trains much, much sooner from a government shift in policy." Stuart Cole, emeritus professor of transport at the University of South Wales, said if electrification had to be re-started from Cardiff to Swansea at a later date rather than be part of a continuing project it could prove costly, whether it was the UK or Welsh governments paying for it. "Any delay requiring a restart of construction will incur the set up costs of a new project," he said. The set-up costs would include pulling together a new technical team with staff having gone to other projects. 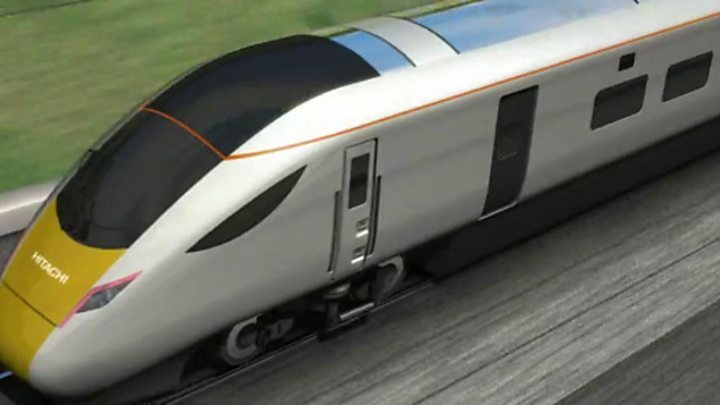 It would also need to procure materials and equipment, with the likes of Network Rail's £5m wiring erection unit having gone to other projects in England. "At present these set up costs are included in CrossRail and electrification to Bristol Parkway. They would then be incurred again," added Prof Cole.